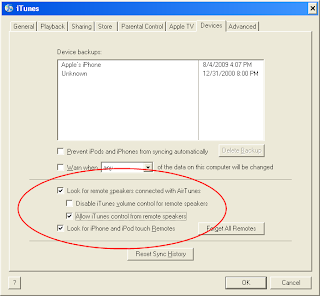 Note (Sep 14, 2010): Since the release of iTunes 10 and the upgrade of AirTunes to AirPlay, I've received several questions regarding this post and its compatability with iTunes 10 and AirPlay. The bottom line is this: Everything in this article is still valid and works. Things could work even better once hardware manufacturers such as Denon and iHome release their AirPlay-capable devices, which would eliminate the need for the AirPort Express devices mentioned in this post and music can be streamed directly to the device using AirPlay. For more information, see iTunes AirPlay's Promise. Imagine having music in every room of your house that you can control from anywhere in the house. You can toggle the music on and off in each room, control the volume, and even change the music. You can do all of that by using an expensive product such as Sonos Digital Music System or another high-end package or you can build your own using components that might already be using such as your iPhone or Apple iPod touch . I've put together a system for our house and several of our friends have asked me to describe how to put this together. This blog will highlight how to get this done without breaking your budget. A PC or a Mac with all your music. The PC does not have to be top of the line by any means and frankly, it's much cheaper to use a PC for this job as you will not be directly interacting with this machine very much. I have mine in the basement and I hardly see it. If you are buying a new one, I recommend getting a PC with lost of storage (i.e. a large disk). An iPod touch or an iPhone. No need to purchase a new one if you have either. An Airport Express and a good pair of computer speakers for each room. For the speakers I recommend either the Bose Companion 2 Series II or the JBL Duet , but any nice computer speakers will do. This project is fairly simple and straightforward once you understand how all the components fit together. To give you a big picture view of what the end system is going to look like, take a look at the diagram below. 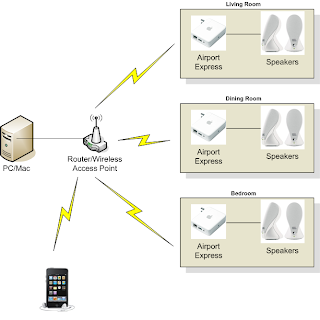 As you can see from the diagram, each room will have an Airport Express device that connects to a pair of speakers using the speakers' audio jack. The Airport Express devices plug into an AC outlet and connect to your network over the built-in Wi-Fi. Your PC/Mac, where the music is stored, connects to your network either using Ethernet (preferred) or over Wi-Fi. Finally, the iPod touch or iPhone will connect to your network over Wi-Fi and will act as the remote control for your music library. Now that you understand what we're trying to accomplish, let's get started by configuring the components one at a time and we'll circle back and wrap together at the end. The first step is to make sure that your PC or Mac has all your music on it and that it has the latest version of iTunes installed (note: as of this writing, iTunes 9 is the latest and greatest and it supports everything discussed in this article). The screen shot below highlights the required settings in iTunes. As discussed earlier, you need an Airport Express device and a set of decent computer speakers for each room that you plan to broadcast music to. The Airport Express device is a multi-purpose wireless device from Apple. It can be used as a Wi-Fi access point, a print server, and what apple calls an "AirTunes" device. The latter mode is what we are interested in for the purpose of this project. Start the AirPort Utility (the software the comes with the AirPort Express when you buy it. You can also download the software directly from Apple (Mac or Windows). At this point, your first AirPort Express device is set up and ready to go. If configured correctly, the light on the AirPort Express should be green at this point. Go ahead and plug the speakers' audio jack into the device. To test out the device and get a test of how things are going to work, start iTunes on any PC or Mac that's on your network and start playing a song. On the bottom right corner of iTunes, click the icon and select Multiple Speakers... At this point, you should be able to see the AirPort Express device you just configured. Click the checkbox next to it and music will start playing both through your computer and through the speakers connected to the device. At this point, you can configure another AirPort Express device, but I recommend that you move to the next step and configure additional AirPort Express devices after everything else is working. The final step of getting your high-end, multi-room music system up and running is to enable the remote capability, for which you can use either an iPod touch or an iPhone. Install the Remote app from the iTunes App Store on your iPod touch/iPhone. Note: This is a free app from Apple. The first time you start the Remote app, you will be prompted to add a library (or click Add Library, if not automatically prompted to add one). A random four-digit Passcode will be displayed. Go to iTunes on your PC or Mac and select the icon with your device's name on it. 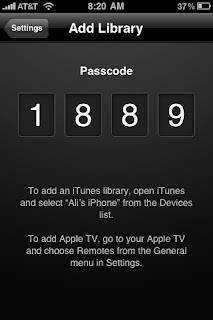 Enter the passcode from the iPhone/iPod touch into iTunes. 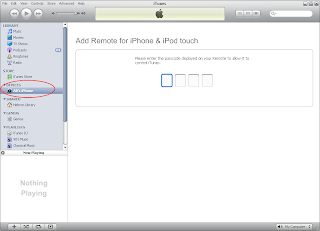 If entered correctly, your iTunes library should be visible from your iPhone/iPod touch using the Remote app. A word of caution: If your iPhone/iPod touch does not show up in your iTunes library, make sure you don't have any other iTunes libraries open on your network. Now that you've configured iTunes, AirPort Express, and your iPhone/iPod touch, you're ready to broadcast your music to multiple rooms and control the music using your iPhone/iPod touch, including having the ability to select music by artist, genre, playlist as well as control the volume and select which speakers can be turned on and off. Now you can add other AirPort Express/speakers to as many rooms as you like. Additionally, you can broadcast music through an Apple TV to your living room, which will basically act like an AirPort Express in this case. Does this all still work with the new iTunes 10? Yes, everything still holds. The "AirTunes" feature in iTunes has been upgraded to "AirPlay" which is even more promising as it allows hardware vendors to embed it in their speakers (and other devices) so it would eliminate the need for the AirPort Express devices mentioned in this post. Unfortunately, there are not AirPlay-capable hardware devices on the market yet, but we should see some before the end of the year (see my recent post about AirPlay at http://www.techblues.com/2010/09/itunes-airplays-promise.html). More specifically, I currently have a set up in my house with 3 Airport Express devices for AirTunes music streaming and it works great with iTunes 9. If I upgrade to iTunes 10, with its new "AirPlay" standard, will my existing setup still work? I'm certainly considering getting an Apple TV when it comes out in a month or so, but I would like to keep using the existing music streaming capabilities I already have too, so that I don't have to buy new hardware to stream music (no need for video) to the three rooms I already have working. I'm hesitant to upgrade my computer to iTunes 10 and then find out it isn't backward compatible, and not be able to go back to iTunes 9. Thanks for all your wisdom! this looks really like an interresting solution for a multi-room system much cheaper that Sonos for example. However I was wondering if this allows you to play at the same time a different music in each room (I think you can do that with Sonos). In order to support streaming different music to different rooms, you need multiple iTunes clients. The clients do not have to have all the music on them because one client could connect to the other using Home Sharing. If you have an AirPlay-enabled system and an iPhone or iPod touch you can also stream directly to that speaker from your device.